If you could time travel, to what moments in time would you go? Among many other moments, I would journey back to my elementary, middle, and high school years to inspire my younger self to develop a deeper curiosity about how the universe works. I'd motivate myself to dive fearlessly into science and mathematics, including all that Mr. Ray, my high school Physics teacher, was enthusiastically offering up during fifth period of my senior year. I would see to it that my younger self embrace the fun and excitement of learning about the notable people who have contributed to humanity's understanding of our place in the universe. Devoid of time travel technology (so far), I'm doing the next best thing in my middle years by traveling down the path of scientific curiosity I bypassed in my youth. Better later than never. Researching the historic notables, their profound discoveries, and current innovations in STEM such as reusable rocketry, electric vehicles, and hyperloop transport (thank you Elon Musk! ), the private space race, and NASA missions, to name a few, has become a passion. Additionally, music, nature, literature, and various aspects of culture fascinate me. I've connected this passion and areas of interest to my love of art/digital illustration. It is at the unique intersection of art and science where I conduct most of my curiosity-fueled expeditions. ThinkArtPrint began to formulate in my mind a few years ago when working on my first Isaac Newton (1643-1727) art print. I sought to convert my telescopic view of his discoveries into a microscopic understanding of his work and life. I wanted to know, "Why is he called The Father of Modern Science?" There, amidst the research I found a man vastly more interesting that the rudimentary version I'd learned about in my youth. Newton was no longer the simple caricature who had an epiphany under an apple tree. Rather, his life is one that reflected the full spectrum of color. Newton's earlier years seem to have been painted in the darker tones of a complex, difficult, protective, introverted, insecure, temperamental, religious, occultist, unmovable, and depressed man. Paradoxically, his later years were generally painted in brighter hues as a generous, kind, affable, socialite with fewer dark strokes. One man, many colors. As I reflect on this personal journey of mine into the life of Newton, it truly feels as if I've reached into the past. By doing so, I've gotten closer to knowing the man behind so many important ideas and discoveries. Perhaps this is my own form of time travel; researching the history of science, translating what I learn into art, and sharing it with other curious minds. I'm excited about what discoveries await me as I continue to peer into the past, survey the present, and envision the future. The latest iteration of my Sir Isaac Newton art print was completed in February 2017. Click image to enlarge. Layered patterns and textures add interest and depth. 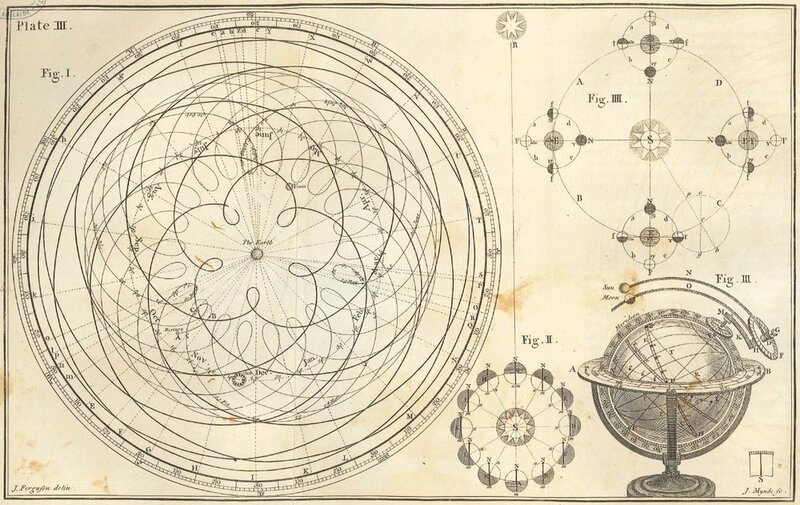 The print features astronomical and/or alchemical symbols Newton used for earth, sun/gold, and moon. One significant source of inspiration for the print was James Ferguson's Astronomy explained upon Sir Isaac Newton's principles, and made easy to those who have not studied mathematics : to which are added, a plain method of finding the distances of all the planets from the sun by the transit of Venus over the sun's disc in the year 1761, [with] an account of Mr. Horrox's observation of the transit of Venus in the year 1639, and of the distances of all the planets from the sun as deduced from observations of the transit in the year 1761, Philadelphia : Mathew Carey : For sale by John Conrad & Co. [and 10 others], 1806. 1st American ed., from the last London ed. / rev., corr., and improved by Robert Patterson. Click here to learn more about James Ferguson. My works are curiosity-driven, artistic adventures through which I seek to explore the myriad intersections of art + STEM. This is where I'm journaling my thoughts relating to ThinkArtPrint research and projects, including my Daily STEM Art personal design challenge. I embarked upon Daily STEM Art to grow as a thinker, designer, and illustrator. Through this challenge I create and share a daily minimalist graphic inspired by discoveries in science, technology, engineering, and mathematics. Daily STEM Art is a personal challenge to research, experiment with, and share a new minimalist and STEM related graphic. Click on any image below to explore.